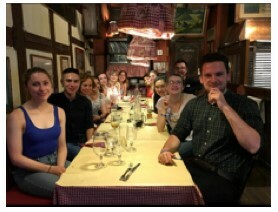 UEA third year student, Ines Abdelli, reflects on her experience of undertaking the Future Leaders programme, and leading a group to travel from Norwich to Strasbourg. As part of the Future Leaders programme offered in the School of PPL we are highly encouraged to lead on instigating and managing a project and project-managing this educational trip to attend EYE was an excellent opportunity to put into practice all that I had learned as it implied taking the lead in enthusing and recruiting participants, organizing international travel, fundraising, networking and project planning and managing. Elizabetha Rusu, my co-organisor, and myself started by researching the costs, we worked out the logistics of the trip and made a project budget plan and. We secured some funding from the department but had to raise additional funds by applying for external grants. Our grant application was successful and we secured £700 from SPRET, an Educational Trust. To recruit participants we highlighted this opportunity to all students in the school via internal email and social media. Many students from the school were interested in taking part but there were many too who could not attend due to clashes with exams. From this I learned that timings of events need to check academic calendars! In the end 15 people committed, a real international bunch, we had Mexican, Romanian, Hungarian, Kazakhstan, French, Dutch, English and Chinese nationalities which made conversations really stimulating during the information events we hosted. I helped students who needed a visa and felt that a great group spirit was built in the different meetings I organised in which everybody felt at ease. In these meetings I provided further guidance on travel logistics to and in Strasbourg and scheduling and signing up to activities to attend EYE. We had to action fast as over 8,700 young people were scheduled to attend this event, which meant that trains and accommodation would sell out fast, we therefore had to be proactive in booking train tickets and accommodation. We came to realize that organizing an educational trip is a challenge but to organize it as being part of a big bureaucratic organization which has so many rules and regulations and procedures for everything, poses extra challenges. For example, one cannot simply pay for train tickets. No, everything needs a quote, budget code and special forms to complete to be signed off and paid for by an allocated person. Unlike in a social context, organising a trip as part of a big organization required great organisational skills as well as an understanding of the different roles and responsibilities of staff across the department. My international background, as a French and EU student greatly helped with booking travel and getting the group organised in France. As I regularly travel by Eurostar myself I had anticipated were the potentially difficulties could be when travelling with a group, so the travel went very smoothly. The hotel was very central and this gave people the opportunity to socialise after the event and travel back to the hotel safely. During our time at EYE in the parliament people from all over Europe participated in various activities including debates and panels of experts, it was a great opportunity to share our ideas on improving policies and practices by the EU. The group explored the parliament and Strasbourg immersing themselves with the French culture! 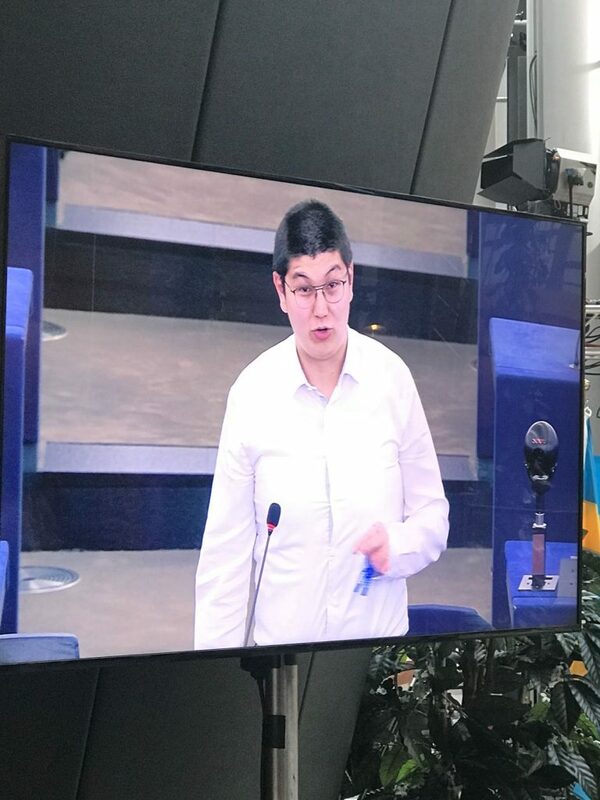 During the two days full of activities at the European Youth Event, I have attended two major sessions which both took place in the Hemicycle of the European parliament. It is the main chamber of the legislative body and I was honoured and truly excited to be there even though I am not a European citizen. Thus I really appreciated the spirit and effort of open Europe that is not exclusive only to Europeans, because I had the rare opportunity to witness active engagement between the youth and policy-makers on such an authoritative platform, because usually people feel the distance or a gap from those who wield power on their behalf. Moreover, the events run smoothly and you could see that the organisers tried their best in order to accommodate all of the young people attending the event, although some moments could have been improved such as the speed of registration. Overall, this was a very positive experience both in terms of things I learnt and ideas that I can aspire to. Going to the European Youth Event was a brilliant and eye-opening experience for me. Attending EYE2018 made me more confident in proposing ideas on big issues, seeing numerous other young people stepping up to the mic in hemicycles. In addition, to this it has made me more confident in my ideas as I was thinking the same as many others there. What’s more, it made me consider what solutions there could be to the big issues in the world right now and forced me to delve deeper into said issue. For example, with regards to terrorism and radicalisation of young people, not just saying education is a solution but what specifically and logistically can work in the current systems of different nation states. It also made me think about the EU institution as a whole. To me it seems a disorganised establishment if the event is any reflection on the running of the EU itself. What’s more, the bureaucracy of the whole system appears to get in the way of implementing new policies, with a panel or committee being made for every decision, small or big. It seems to me after my experience that the EU has reached a point whereby a lot of its work it focused on maintaining the organisation itself so is therefore struggling when working on implementing new proposals. I became a little sceptical of whether the suggestions put forward by the young people that attended would actually be considered my anyone of jurisdiction. I am still questing whether it was more of a publicity stunt and in reality suggestions will become diluted through the bureaucracy of the system. Having said this the even was very much an enriching experience. Being surrounding by both like-minded young people and those with very opposing views to my own was very rewarding and has certainly made me consider some issues in a wider context. I thoroughly enjoyed the trip and thank everyone involved for all their hard work to make it possible. Reflecting on this trip, the true value of this experience is that when people travel together they have to interact and communicate. Most of us did not know each other prior to participating in this trip. We learned more about each other’s cultural background, differing political views but also our joint passion in contributing to making a change I believe that to be the true value of this experience! On a professional and personal level. I believe this was certainly part of the intentions of the organisers of the EYE event to form this inter-cultural exchange with young people not only from Europe but all over the world. More information about EYE and the result of this happening can be found here.